Every time the NASCAR circuit visits a road course there’s a lot of buzz about the road-course experts or “ringers” that are brought in to compete with the drivers who earn a living primarily making only left-hand turns. But winning a Cup race with a ringer is more difficult than it might seem, even considering the different skills required to be successful on road courses. More often than not, NASCAR regulars wind up in Victory Lane. A true ringer has never won a race at Sonoma Raceway in the track’s 28 Cup races since 1989. At Watkins Glen, there have been 38 Cup races without a ringer victory although several races have been won by road-course experts like Marcos Ambrose, but they were competing full-time in the Cup Series when they won at the Glen. But in the 1960s, the Wood Brothers had great success using road course ringers at the old Riverside International Raceway in California. Of the Woods’ seven career victories at Riverside, four were with road-course racer Dan Gurney at the wheel of the No. 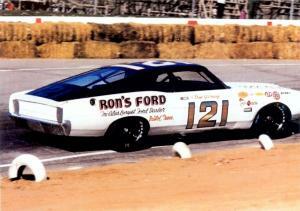 121 Ford. The other three were by David Pearson, who was an expert on any type of race track. Gurney’s win at Riverside in 1968 was one of the final “ringer” wins in the series now known as Monster Energy Cup. Mark Donohue won at Riverside in 1973, and after that all the victories there went to Cup regulars. In addition to the fact that Gurney won in ’68 despite not being a regular NASCAR competitor, he and his Wood Brothers team had to overcome a broken exhaust box and tire problems late in the race to score the win. Leonard Wood said that during the race, which Gurney led for 124 of 186 laps after starting from the pole, Gurney was leading but slowed and began signaling to the crew. Radios weren’t in regular use at that time. “He was holding his hand to his ear, but we couldn’t figure out what he was trying to tell us,” Wood said. What had happened was that the top of a box underneath the car that collected exhaust from the headers before sending it out the side of the car had broken loose. That meant Gurney was having to deal with the side effects of a major exhaust leak. “It was deafening him, plus it was hot,” Wood recalled. Then on Lap 145, Gurney rolled into the pit area with a flat tire. Team owner Glen Wood, Leonard’s brother, noticed shreds of rubber wrapped around the rear axle. It took a lengthy pit stop to remove the rubber from the axle, but it only took Gurney 15 laps to regain the lead and score the fifth and final Cup victory of his 16-race NASCAR career. Leonard Wood said that in the early days of competing at Riverside, road-course experts like Gurney were a second per lap faster than the NASCAR regulars. But the NASCAR drivers soon learned the quick ways through the esses and other tricks that the road-course ringers knew from competing in other series. For example, Wood said Gurney would run a constant speed through the esses, while his then-teammate Cale Yarborough, who drove the No. 21, would be on and off the throttle, which upset his car and cost him time on the track.